Personally food has always played a big part in my life. It’s simple – I love food and it makes me happy! Many of you who follow me on Twitter will already know how I love to hog the Sheffield food limelight, so to take part in all the Sheffield Food Fest’ excitement (4th – 10th July), I wanted to set myself a Food Challenge which would see me eating my way through to a size SHEFFIELD…for the whole week! 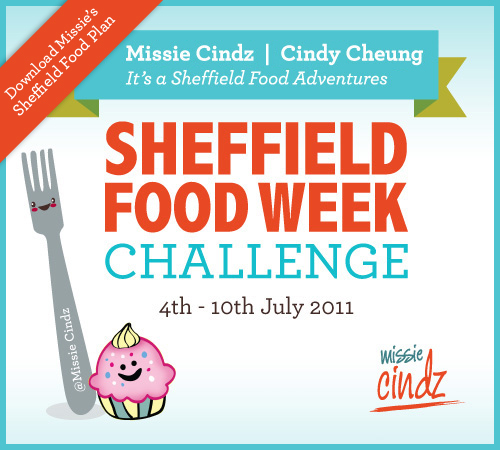 – The ‘Missie’s Sheffield Food Week’ Challenge. A week where I’ll be eating and drinking a huge range of Sheffield related produce, ranging from making my own foods at home (breakfast and dinner) using Sheffield-grown produce and also eating and drinking homemade Sheffield goodness made by our talented local foodies! (see the full list of food participants below). Sheffield has a fabulous food scene and I’d like to share it to others in my own ‘Missie Cindz’ way! During my Challenge (4th – 10th July) I’m going to Blog about my experiences for each meal. This Challenge will be fun, very interesting and I hope some of you will participate with me? or please follow my Sheffield Food Challenge on Twitter, Facebook and here, my Food Blog. Seven days x three meals plus 1 – 2 snacks and treats per day so that’s twenty one different ‘Sheffield’ meals (and also alot of Sheffield snacking!). Join in, spread the word and start thinking about what you will eat and where and who you will get it from…The Menu Plan is now available as a PDF download for you to read (a warning though, it’s very Sheffield and tasty!). As a thank you to my followers who are following Missie’s Food Challenge and ‘eating a piece of Sheffield’ with us, for the duration of the week from 4th – 10th July – selected participating Sheffield food producers from the above list and well known Sheffield restaurants are offering special discounts and samples off food and ingredients that feature on Missie’s Menu Plan. PJ Taste Milk Shakes – made with vanilla, chocolate and strawberry ice cream form Our Cow Molly and Sheffield Milk. PJ Taste Citrus Hits® – Infusions of Yorkshire herbs and fruits with fresh citrus juice. The Great ‘Missie’ Burger – made using Moss Valley Meat pork sausages, Sheffield-grown onions served with Sheffield-grown potato wedges from Our Cow Molly farm shop and ciabatta buns from Beanies Cat Lane Bakery. Sheffield Honey Butter Toast served with Yee Kwan ‘Turkish delight’ ice-cream. and finally I’ll be attending the Forage and Feast with PJ Taste on 5th July – 6.00pm – 10pm at Wyming Brook, Sheffield (so why not let’s go food picking together? )…To book PJ Taste’s Forage and Feast event see here. Where I’m sure they’ll provide us with an illuminating opportunity to discover more about Sheffield’s diverse food culture. More information on how you can participate will be posted on on this Blog – so do keep your fork and mouths on stand by for further details, Challenge updates and I hope you all enjoy the good read and food mayhem during that week!